Mais du Calvados tout le temps. Even today, nearly every farm in Normandy produces its own home-made Cidre Bouché, a sparkling fermented cider aged in oak barrels. In its 'brut' variety, Cidre Bouché resembles champagne, and, in its 'doux' variety, beer, albeit boasting a beguiling bouquet of apple and farmyard. 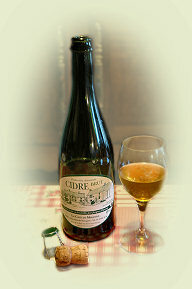 Cidre Bouché is the primary everyday drink of the region. Calvados is a potent apple brandy made by distilling cidre and then ageing it in oak barrels. In my mother's day a community still was hauled from farm to farm to produce this apple lightning. 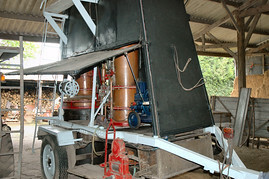 Today many farms which sell Calvados have their own permanent still. 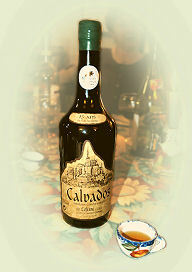 (See article on Calvados.) 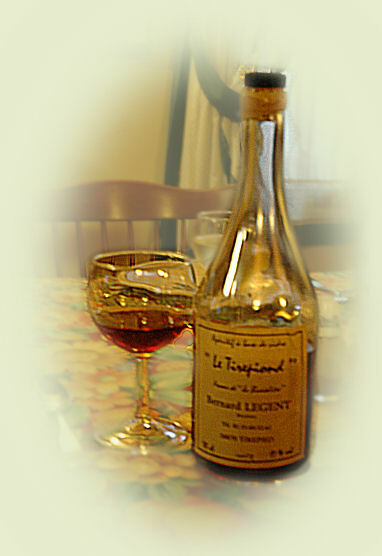 Calvados is traditionally imbibed as a digestif, often added to a demi-tasse of hot espresso, where its delightful bouquet is released and intensified, or combined with apple sorbet, as le Trou Normand, (the Norman Hole,) in between the courses of an elaborate feast (see Le Menu) to make room for more happy indulgence. with which he makes his wonderful Calvados. 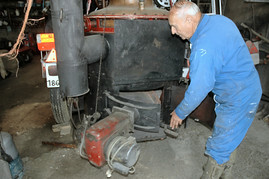 Monsieur Boutemy's alambic is driven from farm to farm in the ancient tradition. 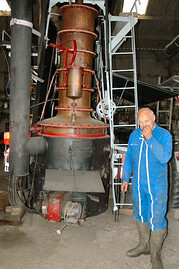 The alambic is fired by a wood-burning furnace. Pommeau is a sweet and fruity liquor created by mixing one part Calvados, aged at least two years, with two parts cider apple juice. The mixture is then aged at least 18 months in oak barrels. 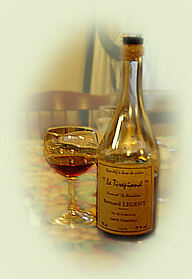 Pommeau is most often served as an apéritif.